We pulled out of Peace River around 9 am yesterday morning. They were repaving the bottom of P road inside the park at Peace River, so we were held up there for a minutes as we tried to exit while they moved some vehicles to let us by. From there it was straight back to Orlando via Lake Alfred and Hwy 17 to I-4 before getting off at exit 55 for the short run north on US 27 to TT Orlando. We were here for a week in November but her for three weeks this time, right into the new year. People in Peace River told us that Orlando was really packed but there is still plenty of room. We tried to get a spot near the park model the kids will be renting beginning Dec 22nd but there wasn’t anything nearby where we could fit easily. Instead, we opted for site G-13 in the 50 amp section. It’s a bit of a stroll back and forth to the pickleball courts and to their cabin but we have our bikes and the walking will do Teddy and the two of us some good. I managed to get our bikes and the Burley Nomad trailer all set up. We haven’t used the trailer since we lost our bichon, Buddy, back in 2009. In fact, the trailer has been in storage but we thought Teddy might enjoy going for the odd bike ride, so we brought the trailer with us. The trailer collapses into a moderate sized carry bag and fits easily into one end of a storage tray. I’m pretty sure I can even load the whole trailer into the back of the Vue if need be. I put Teddy’s bed in the bottom of the trailer and left the top open for him so he could have a look around while we went for a short test ride around the park. He loves the trailer and seems pretty comfortable watching the scenery roll by. Of course, he is still a puppy so we opted to have him tied into the trailer with his leash so he couldn’t jump out if temptation arises. Chris grabbed the above video clip of Teddy enjoying his first bike ride. Today was shopping day for Chris and Julie. They headed up to Winter Garden for much of the day while Teddy and I went to play pickelball this morning. I spent the afternoon cleaning the Vue with Dri Wash. It turned out pretty well and after a little break I started the huge task of Dri Washing Phaeton Place. I used to be able to wash and wax the entire motorhome in a day but now a days I’m content with working on her for an hour or so and doing it over 3-4 days. 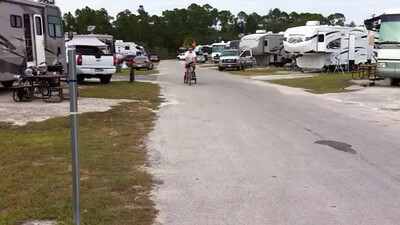 Neither Orlando nor Peace River allow washing of motorhomes or vehicles any longer, citing lower than normal water tables. There are commercial washing services available in both areas but with a wash and wax running almost $300, I’ll work at it slowly and save myself some money in the process. Teddy and I went for a late afternoon stroll and ran into a young couple from the UK that know our pals Jim and Jane. Silly me though, I’ve forgotten their names already. They used to stay here at Orlando but have moved to another park nearby. We are enjoying the warm weather. Chatted with Jane on facebook this afternoon. They are heading back to the UK from Spain for ten days over Christmas and apparently they may be seeing a little snow! Drive carefully you two. Chris’s daughter, Sarah and her husband Matt arrive here on Monday for two weeks. They’ll stay with us in the motorhome until Lindsay and Casey arrive on Dec 22nd. They’ll all share a park model together over Christmas. Should be great fun! This entry was posted in Campgrounds, Florida, iPhone, Pets, Phaeton, Technology, Video.